A candle’s warm glow is sweetened with a unique pineapple design in the Silver Pineapple Glass Lantern! This beautiful lantern features a shimmering silver finish. A candle’s warm glow is sweetened with a unique pineapple design in the Silver Pineapple Glass Lantern! 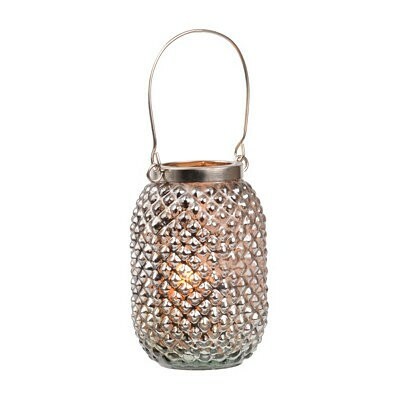 This beautiful lantern features a shimmering silver finish. Lantern measures 4L x 4W x 6H in. Crafted of glass Silver finish Lantern features textured pineapple shape and design Features metal wire handle Accommodates one (1) 2 in. pillar candle; candle sold separately Care: Dust with a soft, dry cloth. Safe for covered outdoor use.